Here is the final green for March. It's a layering combo, so sit down, enjoy. Base is BB Courture Redwood Forest, which was a blogger collaboration with Vampy Varnish many years ago, but a gorgeous color. Scroll down for a separate shot of this one. One coat of BB Couture Redwood Forest. 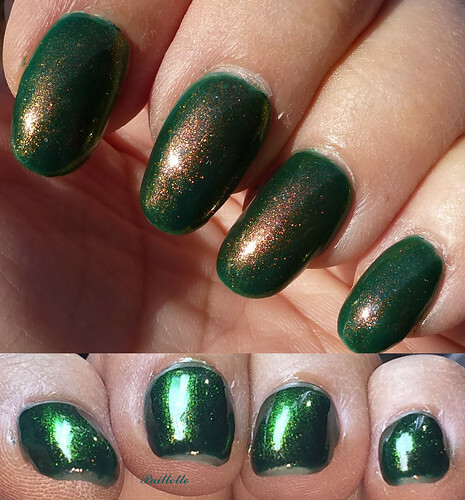 Below that is OPI Jade is the New Black (you really can't see it, but it brightens Redwood Forrest up a touch). I popped on two coats, just to use it up. I have a lot of greens and could have used something else. Topper is Polished for Days Cosmic Dust, a red to gold to green shifter, amazing. One coat. The shift is great, the pigment is dense. It's a mind twister if you love the shift of red to green. Still available on Polished for Days. Super professional site and shipping is great. 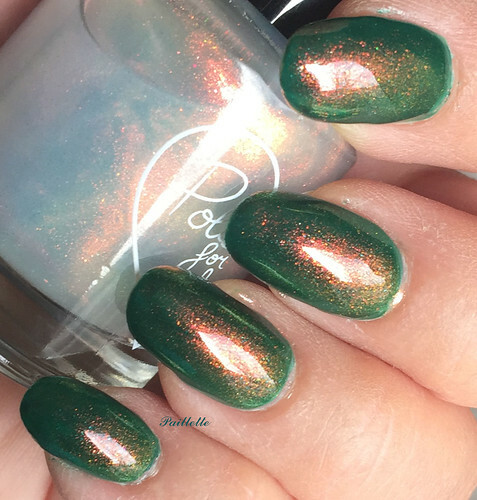 They run a For the Love of Polish box, and they know what they are up to. The sparkle in the sunshine and the green shift never do less than delight. I love this guy. It is so nice with a glass fleck throughout that sparkles. Top photo is under daylight corrected lights with flash, second one is outside. Still available at BB Couture. 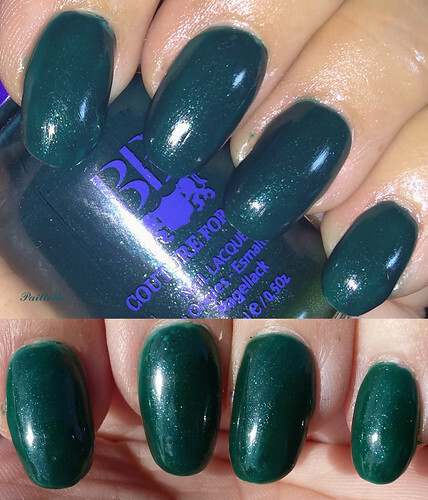 You have to search BB couture nail polish, it will help. If you can grab the Polished for Days, you won't be unhappy. It's so wonderful.